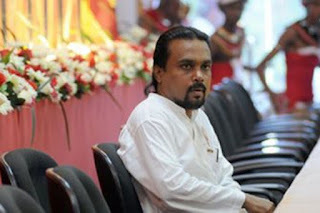 Twenty-four year old Lahiru Janith, a friend of former minister Wimal Weerawansa’s son Wibhuthi Wishwajith Weerawansa, was found dead at the former minister’s residence this morning, Thalangama Police said. Police said Janith had visited the former minister’s Hokandara home last evening and stayed overnight. When he had failed to wake up in the morning, he had been rushed to the Colombo National Hospital, where at 10. 30, he was pronounced dead. Thalangama Police is recording statements from the former minister’s wife, son and Janith Lahiru’s parents.